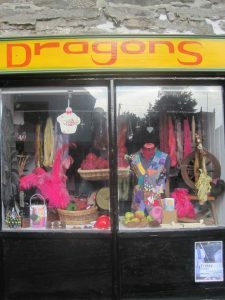 Dragons Co-op is host to Dragons Craft shop who sell gifts and crafts and fair trade and eco products. On Llanrhaeadr YM high street th shop is opn Thursday- Sunday ebery week. There is also a gallery and commnity workspace upstairs. We hold regular crafts, skills and practical workshop. Art studio with regular exhibitions of both local and global artists.